Victor Manufacturing Ltd, located in Bradford, West Yorkshire, are leading commercial kitchen and catering equipment suppliers, producing movable storage units for holding and displaying hot and cold foods before serving. With more than 50 years experience in food and drink servery counters, counter tops and hot cupboards, Victor Manufacturing is able to deliver their extensive range of kitchen and catering equipment to numerous establishments throughout the UK including hotels, restaurants, hospitals, sporting arenas and educational facilities. Victor Manufacturing is already well known for its innovative Bains Marie and hot cupboard prowess, but has now developed specialist, made to measure, foodservice counters all handled and managed efficiently through the company’s comprehensive network of national and local distributors. After nine years as national account manager, Victor Manufacturing’s Michael Inwood has been promoted to sales and marketing director, following the departure of Andrew Gibson. With the busy Christmas Banqueting season approaching maximise Profit & Sales by using the extensive Banquetline range of mobile Banqueting carts. British manufacturing firm, Victor Manufacturing, will be unveiling its new energy-efficient catering equipment at this year's Hotelympia - designed to help save the industry millions of pounds. On stand 1435 they will be unveiling several new products and concepts. The new Inspirations Coffee House in Hartlepool, features a British manufactured eye-catching counter designed and built by Victor Manufacturing. Phil Kirby, Area Sales Manager with UK catering equipment manufacturer, Victor Manufacturing is due to retire this summer after successfully turning his customers dreams into catering equipment reality for the last 20 years. With responsibility for the South West region Phil has become the popular face of the company. Hot cupboards from Victor Manufacturing are known for quality, reliability and robust performance and are a common sight across all sectors of the hospitality industry. Victor Manufacturing, the leading manufacturer of British-made bespoke and ready made counters and serveries, has designed its Caribbean range to be the most versatile range of standard modular countering available to operators today. Due to unprecedented interest from the café bar sector for its new Optimax merchandising units, Victor Manufacturing will be attending the Caffe Culture show for the very first time. Victor Manufacturing Ltd, the leading UK manufacturer of bespoke and off the peg hot cupboards, counters and serveries, has earned a reputation in the industry for the quality, reliability and robustness of its Banquetline range of hot and cold holding mobile banqueting carts. Victor Manufacturing has launched its new Optimax merchandising units to much acclaim from the industry at a series of ‘open house’ days at the company’s Bradford HQ. Victor, one of the UK’s favourite counter and serveries manufacturer is supplying Buckinghamshire County Council schools with its British-made mobile foodservice counters. The World’s End Garden Centre in Wendover, Hampshire, part of The Garden Centre Group of horticultural facilities, is packed full of exotic and traditional annuals and perennials. Victor Manufacturing, the leading manufacturer of British-made hot and cold foodservice solutions, has a range of Heated Display Units for all applications where space is short but expectations high. While the working components in foodservice counters are crucial for safely and hygienically holding and serving hot and cold foods, equally important are the ancillary parts of the operation, namely plate dispensers. 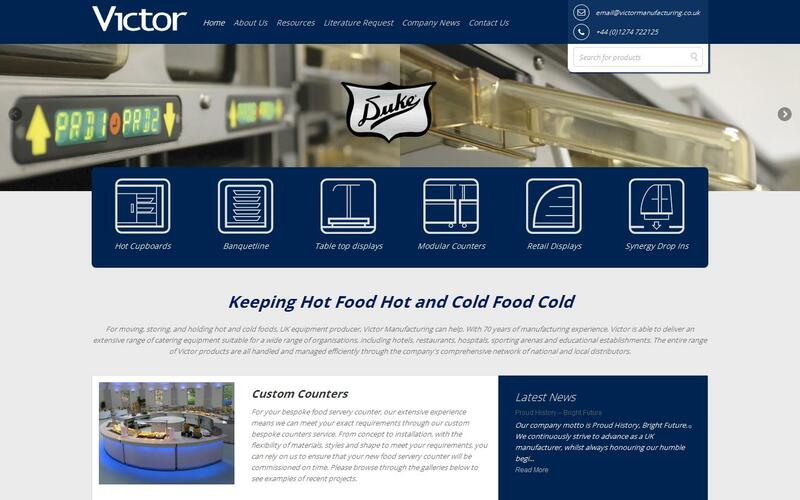 Victor Manufacturing, one of the UK’s longest established manufacturers of hot and cold foodservice equipment is introducing its extensive heated Deli Topper range. 13/06/2011 - Victor Ambassador, You Are Spoiling Us! Victor – a leading manufacturer of British-made hot and cold service solutions, has developed the Ambassador range of energy saving, mobile service trolleys, ideal for the health care sector. Walking into the Claremont High School in Harrow, London, during a busy elevenses period in the new cafeteria, there is an impressive sense of quiet, organised focus. Victor Manufacturing, the leading manufacturer of British-made bespoke and off the peg counters and serveries, developed its Caribbean range to bring optimum versatility in the modular countering arena. Victor Manufacturing, the leading manufacturer of British-made bespoke and off the peg hot cupboards, counters and serveries, has cornered the market in hot holding mobile banqueting carts with its flexible Banquetline range available in single - and two-door options. Just a quick thanks to Danny & Ian for all of their hard work up atDolphin last week, they worked really hard and did a fantastic job.I am really please with the counter as was the client.We look forward to working with you again in the very near future. Just a quick thank you to Danny & Ian for all of their hard work up atDolphin last week, they worked really hard and did a fantastic job.I am really pleased with the counter as was the client.I look forward to working with you again in the very near future.